1881 Two acres purchased and a frame building with a seating capacity of three to four hundred was erected. During the year 28 people had united with Williams Chapel. 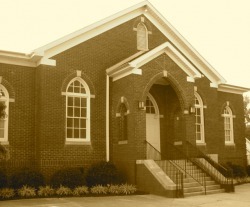 1885 Williams Memorial Presbyterian Church was organized on April 25 with a membership of 76. 1896 A five room frame manse was built. Rev. Jonas Barclay and his bride were the first occupants. 1905 Manse remodeled and two rooms added. 1923 Frame building torn down and brick veneer building erected including seven Sunday School rooms. 1932 Rev. M. B. Prince, Jr. was installed as the Pastor of Williams Memorial. 1936 Community House built by men of the church - now called the Fellowship Hall. 1949 Sanctuary remodeled including a three story educational building. First service after remodeling - Christmas Day. 1955 Frame manse torn down and a six room brick manse built. 1965 Six room Sunday School building built behind church. 1972 Rev. M. B. Prince, Jr. retired after 40 years at Williams Memorial. 1980 Two Sunday School rooms renovated and made into a beautiful parlor and kitchen. 1985 Centennial Anniversary celebrated April 21. Historical quilt presented by the Women of the Church. 1990 Rev. Robert E. Burnett retired after 17 years at Williams Memorial. 1992 Rev. Edward C. Wilson installed as Pastor. Williams Chapel of which Williams Memorial Presbyterian Church is the out-growth was located five miles from the heart of Charlotte, North Carolina, on the Beatties Ford Road. The community in which it was located was a mining district with the usual vices. In fact, a bar room stood directly across the road from the brush arbor in which Rev. J.C. Williams of Hopewell Presbyterian Church came to reach to those interested. Soon the interested group increased and the need for a building was evident. Re. Williams had been called to his final rest and Rev. Frank Leeper had succeeded him at Hopewell. The outpost of Williams Chapel was still active so much so that in 1882 a building lot of two acres was purchased from Mr. Mc Rhee and during the summer a frame building with a seating capacity of three to four hundred was erected. Rev. W.E.McIllwain then became pastor at Hopewell. Before the year closed, an active Sunday school was in progress and some twenty eight people had united with the Chapel. For the next fours years, the work showed much promise. Form the minutes of Mecklenburg Presbytery dated “Paw Creek, March 27, 1885” one reads. Then from the report to the Presbytery meeting at Swannanoa Aug. 27, 1885 the following is found in the minutes of that meeting. “According to the order of Presbytery made in March last a t Paw Creek, A Presbyterian Church was organized in Mecklenburg County on the 25th day of April, 1885, with 73 members from Hopewell Church & 3 members from Paw Creek Church making the whole membership 76. By unanimous vote the new Church was named WILLIAMS MEMORIAL CHURCH in honor of Rev. J.C. Williams deceased a former pastor of Hopewell Church who preached frequently at a stand in the grove near the new church building in which the members were organized into a Church of our Order. A. Frazier, B.F.Brown & J.C. Hutchinson were elected Elders & J.L. Jamison & W.H.Puckett Deacons; and they were ordained and installed to their respective offices. It is recommended that Presbytery receive and enroll the New Church organization under the name & Style of the Williams Memorial Church. The church was originally a frame structure consisting of one large room with the pulpit at one end. At this alter, E.H. Little, President emeritus of the Colgate-Palmolive-Peet Co. was the first baby baptized. Later this building was remodeled by adding a vestibule and two class rooms at the front. In the spring of 1923 the building was torn down and a brick veneer building was erected. In addition to the auditorium, there were seven Sunday school rooms in the building. On November 14, 1948 the Congregation voted to undertake program to build an education building and remodel the Sanctuary. The buildings were completed and used for worship on Sunday December 25, 1949. Spiritual growth is evidenced by the fact that four sons of the Church have entered the ministry. They are Rev. Charles H Little, Rev. Fred E. Gray, Rev. Coy Hunter and Rev. J. Kennedy McConnell. One member, Marcus B. Prince Jr., now preparing for full time service. Evidence is noted, too, by the number who have gladly served the local Church in official capacities and have been active in interdenominational organizations. The various organizations within the Church proper, such as Sunday School Choir, Women of the Church, Men of the Church and the Young People have been active since the organization using the appropriate name for the given period.